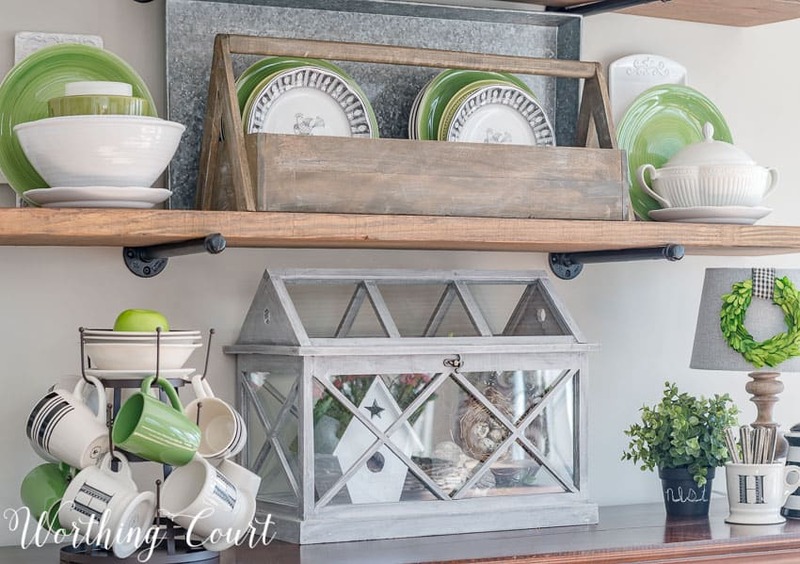 The official start of spring is on the horizon and I’ve decked out the open shelves in my breakfast area in green to celebrate the season! Of course, I kept it super simple by pairing the black and white dishes that I already had with a few green dishes and mugs from the dollar store. No matter the time of year, black, white and green is one of my favorite color combos. I added my terrarium filled with a birdhouse, a couple of nests and a chippy concrete bird. That birdhouse was originally painted with Christmas colors, but I gave it a coat of white spray paint and covered the roof with some stick-on moss. I only needed to add two green mugs to my mug tree for an bit of an accent. You can see that I’ve layered a couple of different shades of green plates in the toolbox with my other plates. 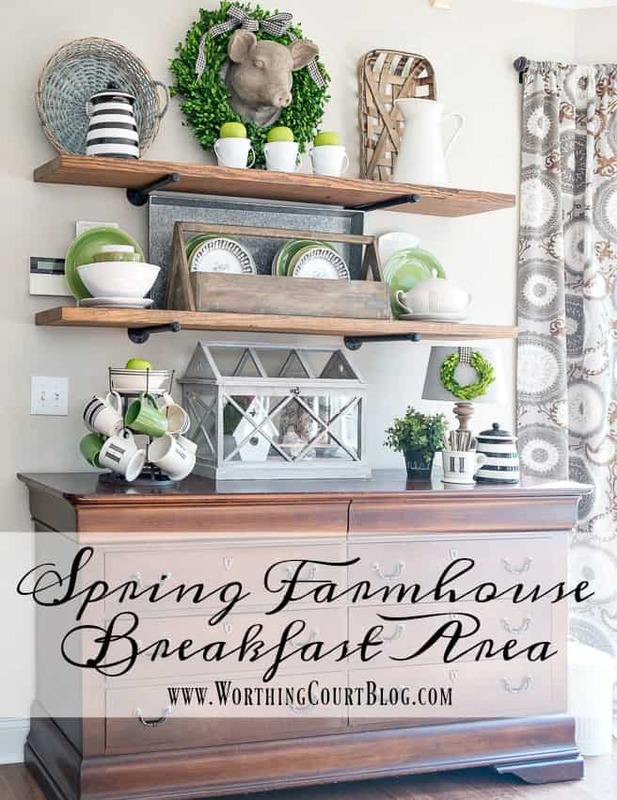 By using what I already own, I was able to only spend $6 for a fresh does of spring in my breakfast area! The spring centerpiece for my kitchen table couldn’t possibly be any easier! All I used were three potted flowers from the grocery store lined up in a wicker tray. You might remember these from the very special weekend that we had here a couple of weeks ago! I love the pop of bright color that they add to the room! What’s your favorite way to welcome the season? Lovely, my favorite color is green. It’s so vibrant in spring here on the farms and fields. Can’t wait. I love everything about your Blog. The green is so pretty. Spring fever is upon me now. Really enjoying your color combo of green with black and white. I love the three potted flowers on the wicker tray – so simple but oh so perfect! And I’ve been wanting to add a terrarium to my decor, too – seeing yours makes me want to get on that soon!! Thanks for the great ideas and easy looks! Yes green!! My favorite!! Love your spring decor for sure? Love the green! My favorite for spring for sure! Everything’s beautiful! Love the green plates for a pop of spring color, great idea! Great ideas, makes me want to get ready for spring too. Lovely! I think my favorite thing is that everything is not white or cream. Thank you! love the pops of Green. Lets all think spring. Love your breakfast area! I like the black, white and green combo – it just looks so fresh. Beautiful! My favorite color is green, especially in spring. I never thought of hanging a little green wreath from a lamp shade. I love it! I like the flowers on the table in the long basket. They look so fresh and a nice pop of color. I love the way that you changed your shelves with items from the dollar store. All of the green looks so good. Beautiful Suzy. 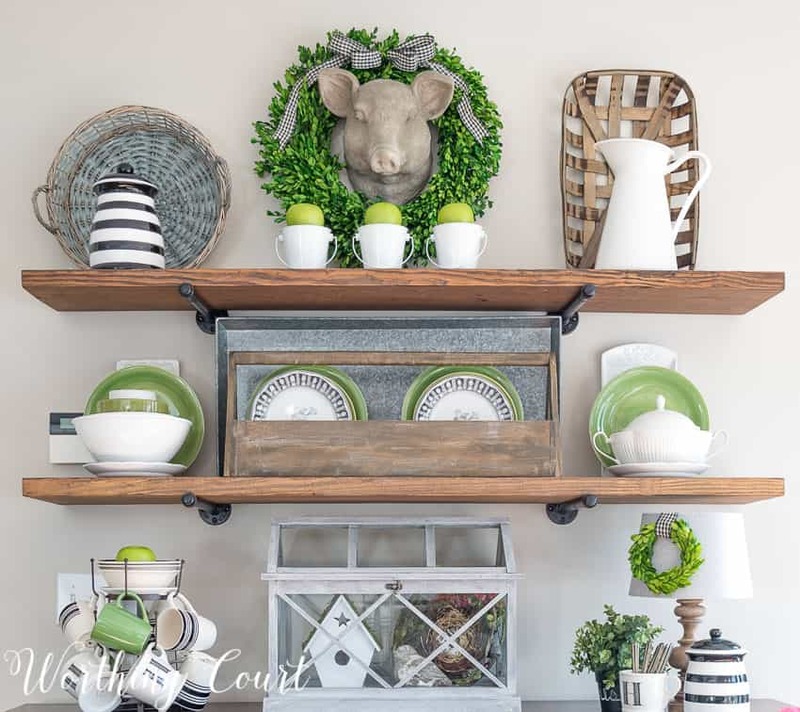 I just finished decorating our new industrial shelves (thank you again for a great tutorial), and incorporated my favorite neutral palette (white, tan, black) with a touch of apple green. Love green this time of year! Pantone’s color of the year (or close to it!)! So pretty! I think I’m beginning to realize that I have faltered on the side of white/tan/aqua in my Wee Abode. Will need to think about sometimes changing out the aqua. Live and learn! Green is my favorite color and it looks just perfect in your dining room. Hoping for an early and lovely Spring! Love it all! So fresh and inviting! Looks great ! Love it! What a beautiful springtime display! It is so bright and cheery and really gives you the feel of spring! I like the black, white, and green color combination too! Thank you for always sharing beautiful and doable ideas. Love the spring look you’ve created. I especially like the centerpiece with the lined up flower pots. I just added touches of green to my living room. I like lightening up the colors for spring! I love how your room looks like a showcase, but you did it all with what you had plus a few inexpensive items. You did very well. Your décor is beautiful. I love the colors and the style. Thanks so much for sharing it at the Family Joy Blog Link Party this week! Beautiful!!! I love all of the pops of green! I love your curtains! Would you share the name of the fabric? Hi Tonya. My curtains came from Target, so I don’t have the fabric name for them. Sorry I couldn’t help! Beautiful decor and dining room. You have great style. Adding to my Pinterest queue. I’d love for you to join our link up To Grandmas House We Go. I love your green accents. It is always such a fresh colour for Spring. Just lovely! I’ve been sprucing up our home and have a long way to go to get it this gorgeous! Happy spring, almost 😉 Thanks for sharing at the Inspiration Spotlight party. Pinned & shared. I love this so much! Thank you for partying with us! featuring you tomorrow! Just…wow! Your home is stunning. 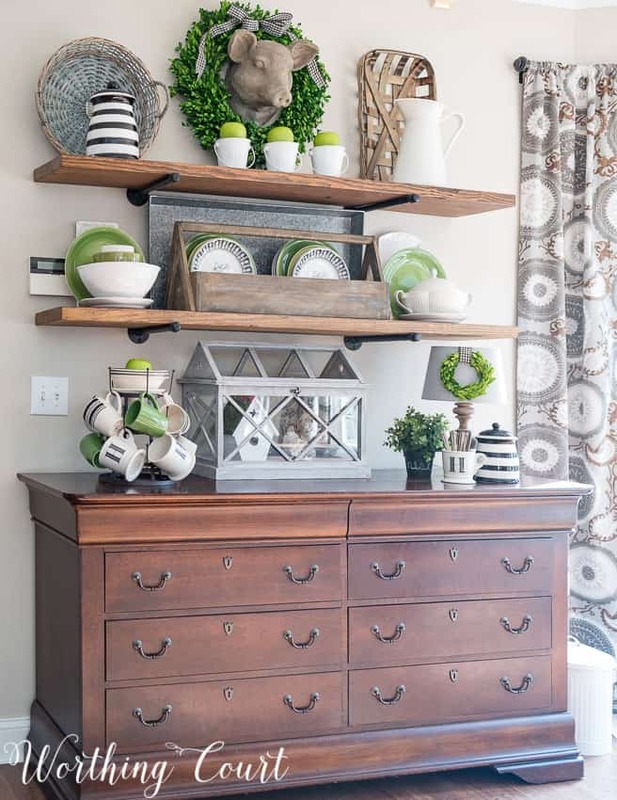 Love the shelves, love the furniture, love the knick-knacks. I want your house!!! Your home is so gorgeous. I want to live there. I love this breakfast area. I am partial to green,it is one of my favorite colors. Everything is so lovely and inviting. Thanks for sharing. I have enjoyed this post. I love the way you have set up the breakfast area. just found your blog and love it. Just purchased your paint color and will paint a small chair soon. You gave me the courage. THANKS!!! Your house is so lovely and welcoming! I love your breakfast nook! Wow! I’m limited in decorating after an accident but, with your inspiration, I could totally do this! 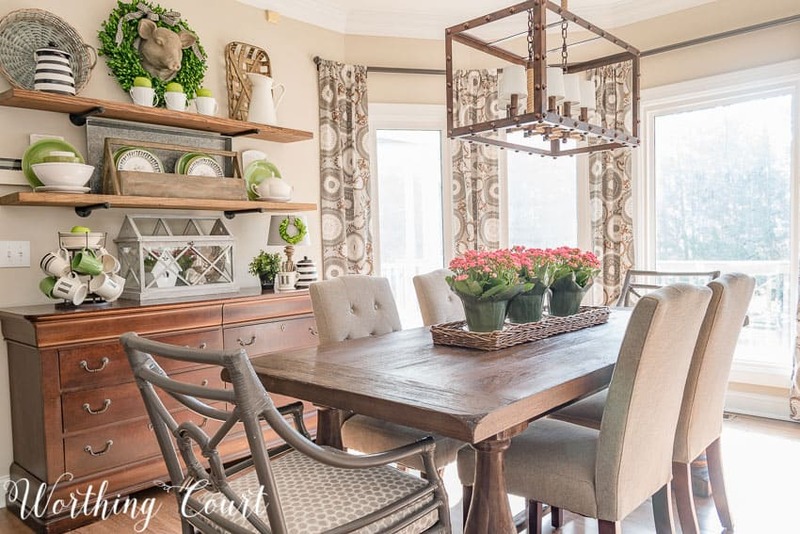 Love the touches of green, but the dining room is beautiful no matter what you do! Just want to say how much I enjoy your blog. Your style is awesome! Thank you for the time and effort you put into it. Love your dining room, black, white & green is a favorite color combo of mine as well!! Love this. I hurt my back in early January and have not been able to do much around the house. I am itching to do some redecorating and rearranging but I can’t move furniture! I absolutely love green! This looks so cute with just a few changes!! So glad Spring is here. Thank you for the giveaway. I have just started with some galvanized accents and the toolbox is next on my list of things to find. You have such good taste. I keep returning to this office makeover and see something I didn’t remember from before. I like the added touches that you make such as the wooden ball on the bottom of the chandelier. I am enjoying returning to past posts as well as the new ones. I love the black and white dishes with the green accents. I hope you don’t mind copying. It’s the highest form of flattery, right? 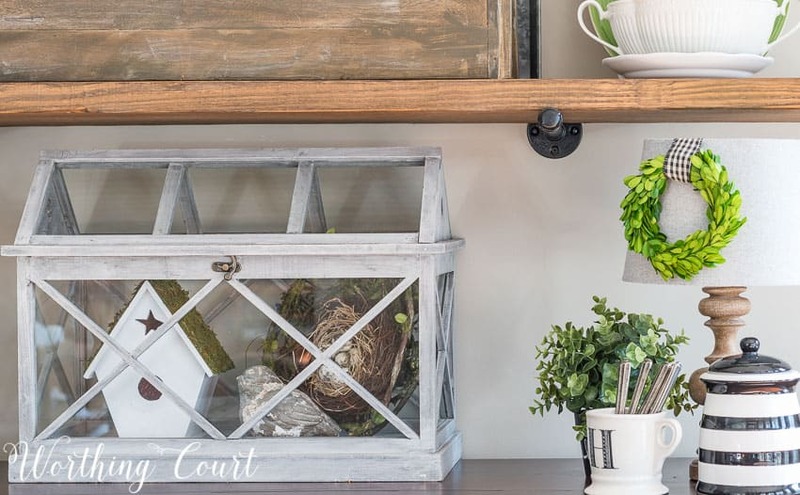 I recently subscribed to your blog because I absolutely love your twist on farmhouse decor. Thank you for this blog! Love the pop of color from the 3 pink plants on the table! The light fixture in dining room is beautiful. I am loving the green for spring! so fresh and pretty! love the pop of pink with the spring green!! Love the green and neutrals. Love this! I have to ask where did you get your lighting fixture?? I’m in love with it! 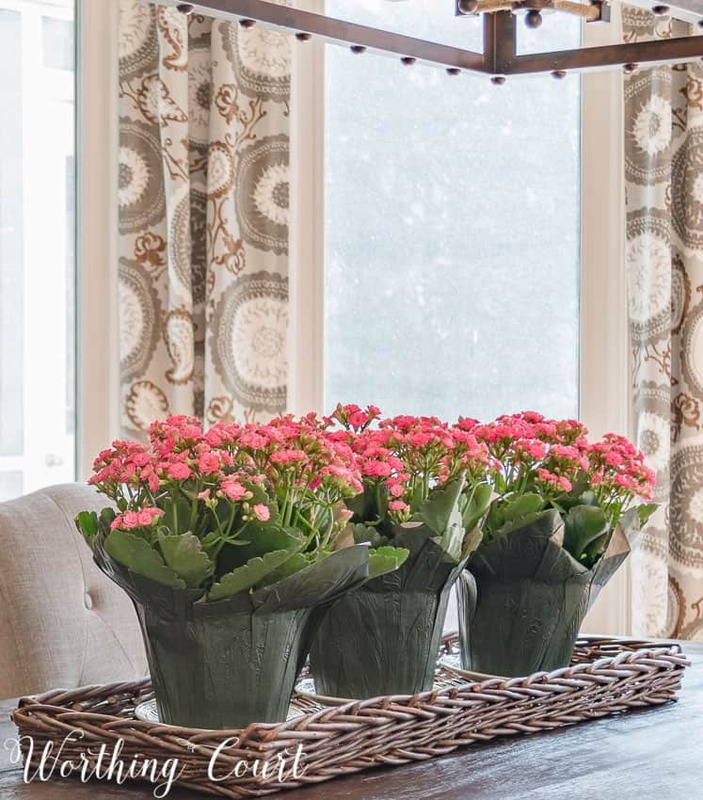 Kalanchoe is a great choice. Sturdy yet sweet! I’m loving the green additions; so crisp and clean! I really like the way you keep the majority of your decor and change it with just the addition/ subtraction of a few accessories. I’m trying to learn and abide by this technique. I also like a color with black and white. I look forward to the first signs of spring each year, Michigan has such long winters. Your blog is a welcome escape and you have a lovely home. What did you use to hold your shelves? Thank you! Absolutely beautiful. Love the green.